What an interesting week this has been. I met and talked with some great moms this week that helped me commiserate over the not-so-joys of pregnancy. Misery loves company! Mostly because you feel really alone in this process and you hate to always complain but yet you worry if all this STUFF is normal. Thankful to have met some outgoing, vocal ladies who shared their tales of woe with me and made me feel better in the process. They have inspired this blog – inspired me to be real and share it ALL. This may be where this entry gets a little TMI for some folks, and if so, I am warning you now…..but I am talking pregnancy woes so what did you expect. If you have never been pregnant, you NEED to keep reading. If you are a guy, you NEED to keep reading. If you are a Mom, you NEED to keep reading. This is the real deal folks, and if you ever plan to be pregnant or be around a pregnant lady, you might as well know the gory details! One of the first odd signs of pregnancy I noticed was the new body hair! I know it is from the hormones, and I really think since I am having a boy, the testosterone makes it worse. I have never had an issue with facial hair and have never had to wax or bleach, just an occasional use of the tweezers. But oh BOY has all that changed! I swear I see a mustache and my peach fuzz has become a baby-fine beard! And I have found a CHIN HAIR. I pull out as much as I can stand with my tweezers EVERY night, but what the heck. Seriously, if I knew I wouldn’t have to do it forever, I would start shaving. It IS that noticeable to me. No one ever told me that being pregnant also raises your metabolism, therefore raising your body temperature, therefore making me sweat like no ones business! Good golly, I realize my body is attempting to cool myself off but in this Florida heat, it pretty much drowns me. I switched to prescription-strength deodorant, deodorant soap and have threatened to not leave the house until this baby comes out. Thank goodness we don’t pay for water since I shower and bathe 2-3 times a day! Aches and pains and soreness, oh my. From ligament pain in your stomach that feels like being stabbed to pressure on your lower region to horrible carpel tunnel pain, the body aches that come with pregnancy are NO JOKE. Apparently as your uterus, hips and pelvic region prepare for birth, they need to relax, stretch and release ligaments and muscles. Well no one tells the rest of your body to ignore this process so EVERYTHING stretches and contracts. Who would have thought extreme wrist and hand pain would be a sign of pregnancy? Seriously, I am not sure I can pick a baby up as bad as they hurt. And the doctor tells me there is no relief. I sleep in wrist braces, and will probably be wearing them full-time in the next few weeks. Bumps and lumps – from my face to my chest to other unmentionable locations, I keep finding bumps, and acne, and heat rash, and skin tags EVERYWHERE. Again, blame the hormones, but the destruction of my skin is worse than my teenage acne years combined with my tanning bed addiction of my 20’s. I am controlling the acne and rashes with a natural-based cleansing regimen, but the skin tags. What. The. Heck. I feel like my body is diseased every time I find a new one literally pop up. 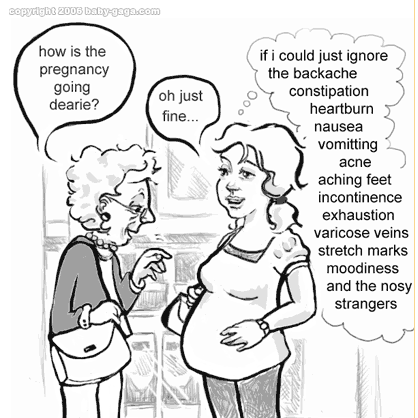 And yes, I have shed a few tears over this pregnancy symptom, especially when the doctor told me not to worry, I can just have them all removed after the baby comes. I think my count is up to 12, and some are in places I can’t imagine having them removed from! And everything is starting to swell. Some days its my face. Other days its my ankles and feet. And for the past few weeks, it also includes my girly parts. Yup, practically swelled shut and causing pain most days. Ankles I expected. Face I could have guessed. But my hoo-ha, seriously?!? No one tells you these things! There. I said it. Well most of it (I have to save something to talk about next week.) Told you it wasn’t pretty, but this is the real deal folks. Pregnancy ain’t pretty! Or easy! Thankful to my mommas who will read this and nod their heads and agree, and maybe even laugh a little knowing its all true and there is nothing you can do about any of it! And please, don’t tell me, it will be over soon…..said no woman EVER who was 7-9 months pregnant in the Florida heat while dealing with all of the above. Can I get an Amen from the Miserable Mommy Club members? ?